When providing buffet service to your guests, having the right serving counters is important. 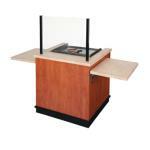 At Hotel Restaurant Supply we provide a large collection of food bars, displays and serving counters. Here you will find our pick of cooking equipment stands. These lovely laminate and composite service counters can be used with electric cooking surfaces to provide hot dishes right in the buffet line.